Allow me to introduce you to NUGGLIFE! The way of the hustling American. 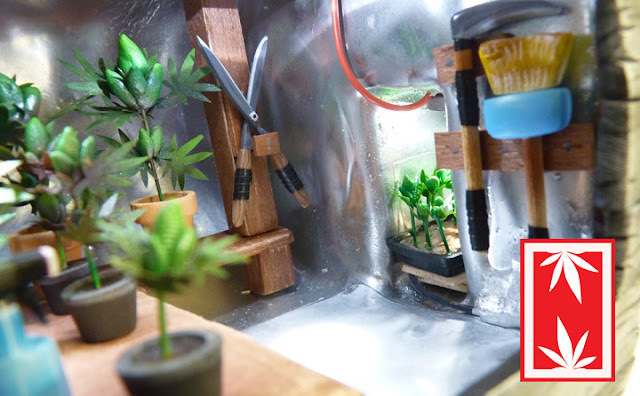 Where growing, cultivating, packaging and pushin has become a part of our society. Amongst this underground lifestyle mad characters are lookin to get theirs. Now I know you're all thinkin the ghetto here, and damn straight, lotsa trees make their way through the hood. That's where my boy, THUGZ, is holding it down. 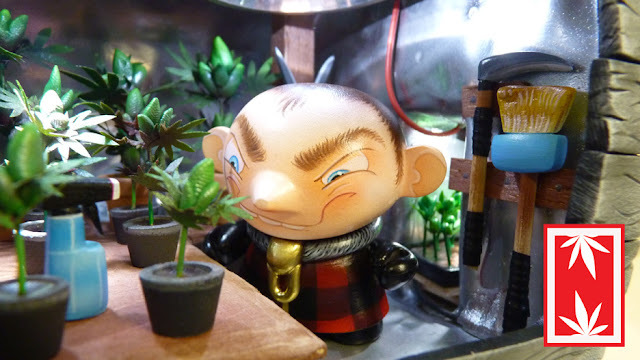 Crook ED the cop also takes and makes his green off these streets. While NUGGS is growin the crops on the mountain tops. This is where things can get stickey. Operations must be well maintained to keep under the radar of the ever-watchful eye of the DEA. A few more close-ups below, but you can see 60+ images on Ian's Flickr here. Keep in mind as you look at these images that every tiny piece has been crafted by hand, and painted with the utmost detail in acrylics, by Ian Ziobrowski. Welcome to NUGGLIFE! 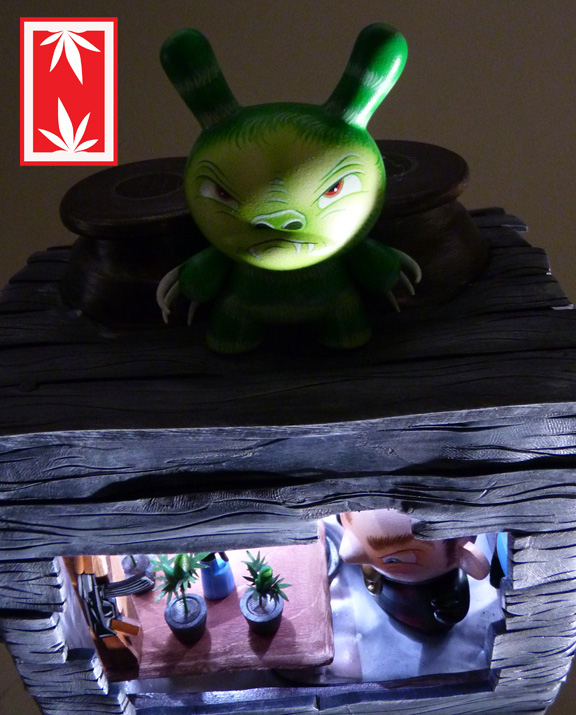 Look for a collaborative NUGGY project later on in 2011 (a Tenacious Exclusive limited series!!!). 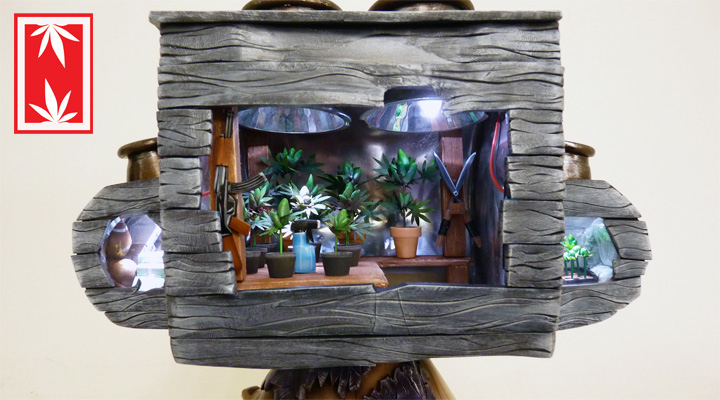 Next week on Friday April 22nd, we will be exhibiting at a toy-centric NYC event called Toy Street. 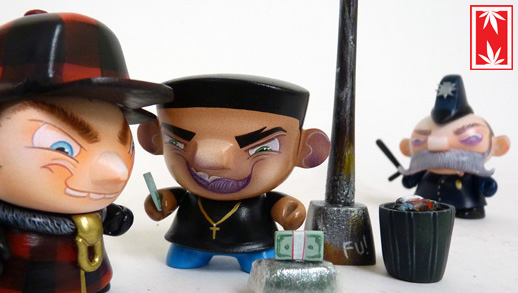 Toy Street is put on by the Cookies N Cream crew at 268 Mulberry Street in NYC. This will be a one-day event running from noon to 8pm. Admission is FREE so definitely plan on coming through. We've put together a few neat projects which we'll be kicking off at our Toy Street booth which we are sharing with Lou Pimentel, a talented local artist and friend of ours. 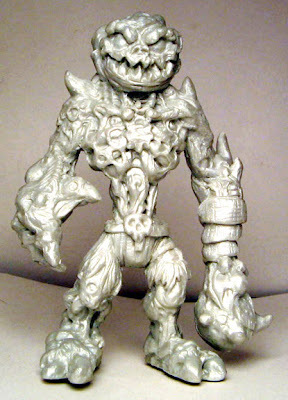 The first major project we'll be unveiling is a collab with OsirisOrion which we've had in the works for a while: I sent Osiris four dozen of Buff Monster's mini Ice Cream figures. 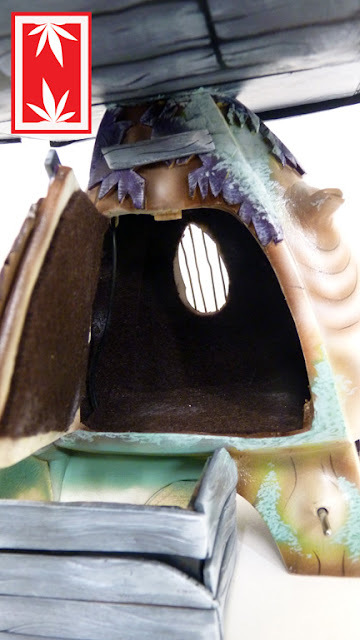 This awesome series of customs will feature the amazing and beautiful paint which we've come to expect from Osiris. 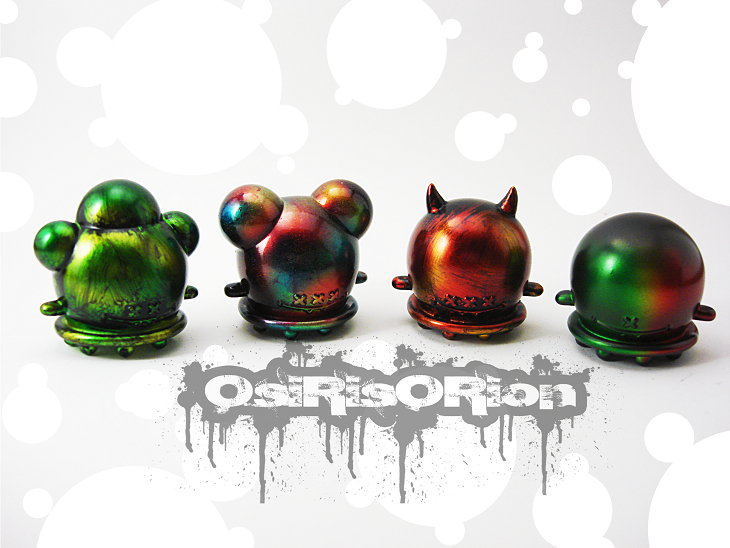 These figures have 4 basic shapes, and each shape has it's own Orisis-style colorway. From left to right (above) are: Sewer Sludge, Oil Slick, Molten Lava, Rainbow Cookie. Each custom will be bagged and tagged and will sell for $25. Osiris will be on hand to meet, greet and sign. We ran these by Buff Monster and although this project is in no way associated with him, he saw the images and gave his stamp of approval. The next collaboration we will have available at Toy Street is the above Pearl White Skekiltor 4.5-inch resin figure by Halfbad Toyz. The Tenacious Exclusive Pearl White Skekiltors were made in a limited run of 20 pieces, and the price is $18 each. Halfbad Toyz will have their own table at Toy Street where you'll be able to pick up a lot more of their toys and merch. 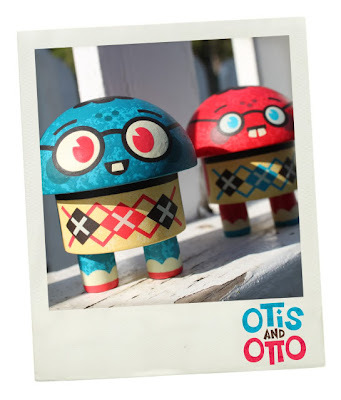 We've had a request from OG from the Big Kev's Geek Stuff show to stock the Scott Tolleson 2-figure set called Otis and Otto, so we will be bringing a few of these to Toy Street in the Blue/Red colorway (pictured above) as well as the Orange/Purple colorway. Otis and Otto are $25 per set. These are a worthy companion to the Scott Tolleson Uncle Argh Mini Qee that we are currently accepting preorders for here. If you haven't listened to the Big Kev's Geek Stuff show, you can check out past episodes here. We're currently running a 3A Large Martin giveaway on their show (to air tomorrow night) so click here to go to their site and learn how to enter to win! 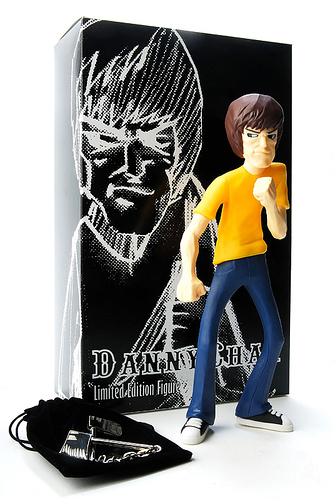 Our show special for Toy Street will be the 9-inch vinyl "The Dragon" figure in the OG colorway seen above. 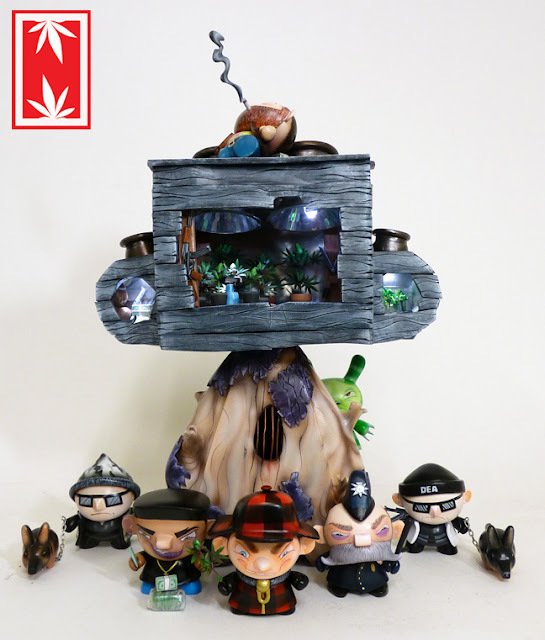 Designed by Danny Chan for the clothing label REMIX, this figure will be priced at $12 each just for the duration of Toy Street. That's about one third of the normal price. 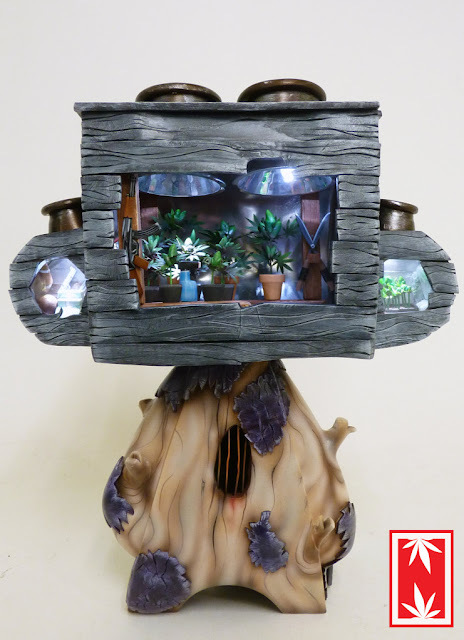 In addition to all of the above fun stuff, we will also be hosting NEMO, who's coming in with a micro-series of four 4-inch hand-carved wooden tiki figures. Will post images and pricing once those are available. 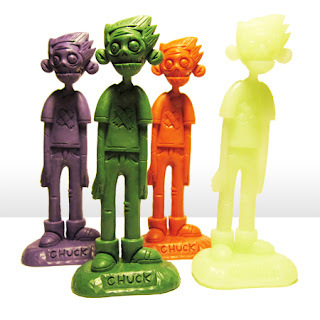 We are also hoping to replenish our stock of Zombie Chuck figures in time for Toy Street. Our Tenacious Exclusive blue Zombie Chucks sold out so fast that we thought we'd get some more. 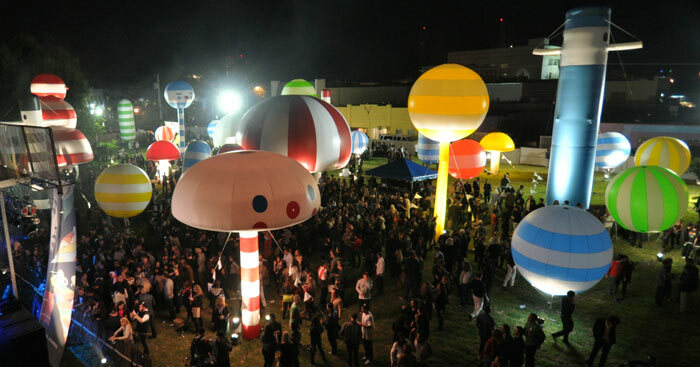 And we'll be giving out stickers and selling a variety of designer art toys all afternoon, so please do stop by! Win a 3A WWRP Mr. Frosty from Big Kev's Geek Stuff and Tenacious! 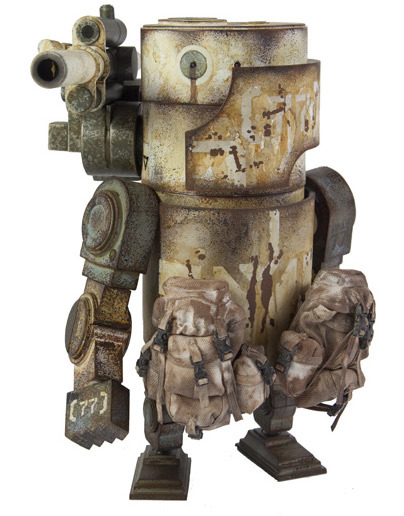 We are providing one of the brand-new ThreeA WWRp Large Martin Mr. Frosty 9-inch figures as a prize for a contest which will begin this weekend on the Sirius XM radio show "Big Kev's Geek Stuff" hosted by my buddies Kev and OG! Saturday night (April 15th) at midnight (EST) the episode will go live on Sirius 197 XM 202. If you don't have a Sirius account, you can click here to get a free trial. Or, you can sign up to get the podcast, download past shows on mp3/mp4, or sign up to their RSS feed. So really, there are a number of ways to listen to the show. Click thru to the Big Kev's Geek Stuff site for all the details and more info on these two geeks! They will have to hear the show for the phrase. But they can listen to either one to get it so it's really pretty easy to enter as we wanted to keep it open to anyone who wanted to enter. We've set a deadline for entries at 4/27/11 5pm est so that if there is a delay in listening to the podcast you can still have a chance to enter and win. FriendsWithYou is a design studio working in a variety of industries: they have designed some cool toys, like the kid-safe Wish Come True series of mini figures. They also put up these crazy 40-piece inflatable installations, and I was very excited to read in their newsletter that they are coming to NYC some time this summer! This is an event sponsored by AOL (yeah, that surprised me too- does anyone under the age of 60 use America Online anymore?) and further details are forthcoming. Namely, date and location. I'll post that info here as soon as I get it.